With short hair, trendy clothes and accessories, people are often surprised by the appearance of female shooting coach Nguyễn Thị Nhung. At the age of 54, the mother of two looks very young and very active. “I am always happy. Maybe that’s why I seem to get younger every day. But above all, I am optimistic and enjoy life. I am lucky enough to work with many young shooters so I also learn from them,” Nhung said. Nhung is considered the “Iron Woman” of Vietnamese shooting, as she is always determined, disciplined and dedicated. She is also behind many of the country’s shooting achievements. “If you ask athletes trained by me, they all say I am too strict. That’s my principle. I think every coach is severe. In sport, training to be an elite athlete is difficult. Sternness helps athletes try their best and achieve their goals,” said Nhung. As the head coach of Việt Nam’s national shooting team for more than 10 years, Nhung helped Việt Nam win one silver and three bronzes at the Asian Games in 2006; one silver and one bronze at the Asian Games in 2010; a gold medal and world record at the World Shooting Cup in 2013, gold medals in the Southeast Asian Games as well as awards in regional shooting tournaments. 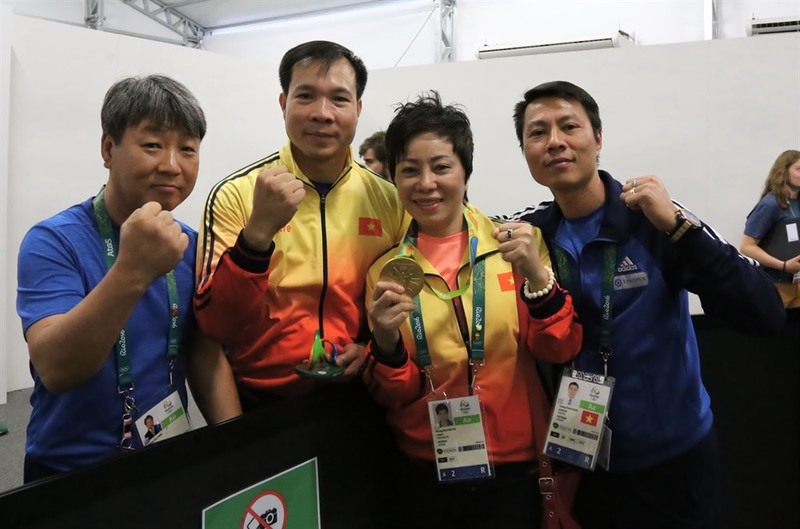 Nhung trained Hoàng Xuân Vinh to bring home one gold and one silver at the 2016 Olympic Games in Brazil. 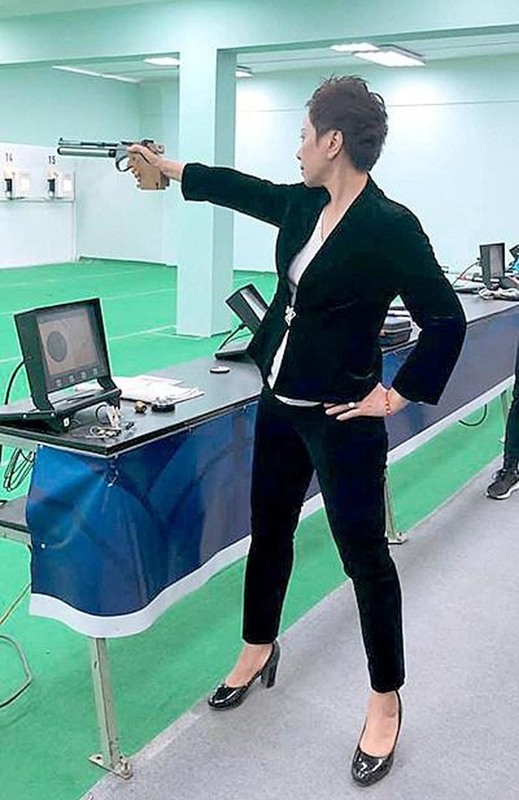 At present, she holds three positions: head coach of the national shooting team, deputy chairwoman and general secretary of the Việt Nam Shooting Federation and head of the shooting section at the National Sports Administration. Nhung fell in love with shooting when she was 14 years old. Until 1983, Nhung held many national titles in the women’s 25m pistol. She retired from competition in 1985 and then got a shooting coach licence after training in Moscow, Russia. “I think shooting chose me and forced me to follow it. This work requires strength and high focus. Each contest often lasts around an hour. While each bullet takes just seconds. The remaining time is for shooters to prepare in silence. So because of my work, I became stronger,” said Nhung. “I think shooting is an artistic event. When you shoot, you need to be like a pianist. You need to follow a rhythm like playing a piece of music,” said Nhung. People think that it is a monotonous sport, but each shot is a series of movements. If a shooter holds his breath too much, the pressure can stiffen their fingers. During her coaching sessions, Nhung breathes warmth into the cold world of guns and ammunition by taking an interest in her shooters. “That’s my responsibility. That is also how to know when a player is fit,” said Nhung. Under the guidance of Nhung, marksman Vinh topped the podium at the Rio Olympics in 2016. “I was very happy and never thought that Việt Nam could win an Olympic gold medal. The gold medal is a dream for all competitors,” said Nhung. According to Vinh, Nhung is truly an “Iron Woman”. “She inspires athletes and strengthens their spirit. This is very important in shooting,” said Vinh. “For me, Nhung is both a sister and a trainer, so I always pay her respect. She is always dedicated and thoughtful. We feel secure when having her in any competitions,” said Vinh. Nhung and her shooting team, including Vinh, are in training for the upcoming Southeast Asian Games later this year as well as World Shooting Cup events in Beijing in April, Germany in May and Brazil in August. After competing successfully in the Olympics, Vinh failed in the Southeast Asian Games in 2017 and several other events. Both Nhung and Vinh are under pressure to turn it around.